After a devastating fish kill on the Klamath River, tribal members and theatre artist Theresa May developed a play to give voice to the central spiritual and cultural role of salmon in tribal life. 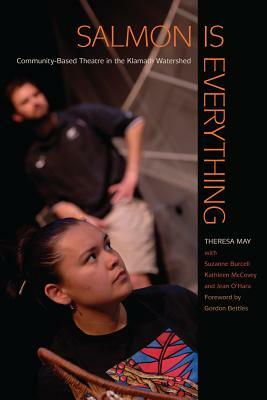 Salmon Is Everything presents the script of that play, along with essays by artists and collaborators that illuminate the process of creating and performing theatre on Native and environmental issues. Salmon Is Everything simultaneously illuminates the logistics of a crisis in the third largest watershed in the Pacific Northwest—the premature death of more than 30,000 salmon on the Lower Klamath River in 2002—and documents what happened when one community decided to use art to amplify the experiences of its members. The fish kill had unprecedented impact throughout the watershed, and for many tribal communities it signified an ongoing loss of traditional cultural practices. But in the political and ecological upheaval that followed, the role of salmon in tribal life went largely unacknowledged, which inspired the collaboration between May and members of the Yurok, Hoopa Valley, and Karuk tribes, as well as farmers, ranchers, and others invested in the Klamath watershed. Salmon is Everything will appeal to readers interested in the environmental and cultural history of the Pacific Northwest and the ecological and civil challenges its communities face. For artists and activists, it’s a useful case study. Salmon is Everything offers a unique interdisciplinary resource for high school and college level courses in environmental studies, Native American studies, and theatre arts education. Theresa May—director, playwright, and associate professor of theatre at the University of Oregon—is a leading voice in ecological theatre. She is co-founder of Earth Matters on Stage, an international ecodrama festival; co-editor of Readings in Performance and Ecology; and co-author of Greening Up Our Houses, the first book on sustainable theatre management. She was the founding artistic director of Theatre in the Wild, a site-specific, community-based theatre in Seattle.